If Range trooper really is 1/6 and you get two, would you be willing to trade or sell one? Sorry, realised I never spoke up about this. Yes, I can hold my duplicate for you. 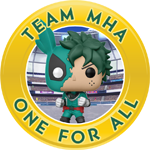 Also, there is no way of knowing if you are getting Case A on the Funko site, right? Or is case D the non-Funko shop version? I'm confused. Can confirm Case A has the 1/72 Han! Case D is also from the funko shop and has the other two exclusives (including two of the trooper). Great Solo. Someone else is selling the cases or just Funko? Case C has Enfys Nest as the rarest figure at 1/24. So that is probably the worst case but at least you get the exclusive beckett and 2 range troopers. Are the cases labeled on the shrink wrap when you get them? 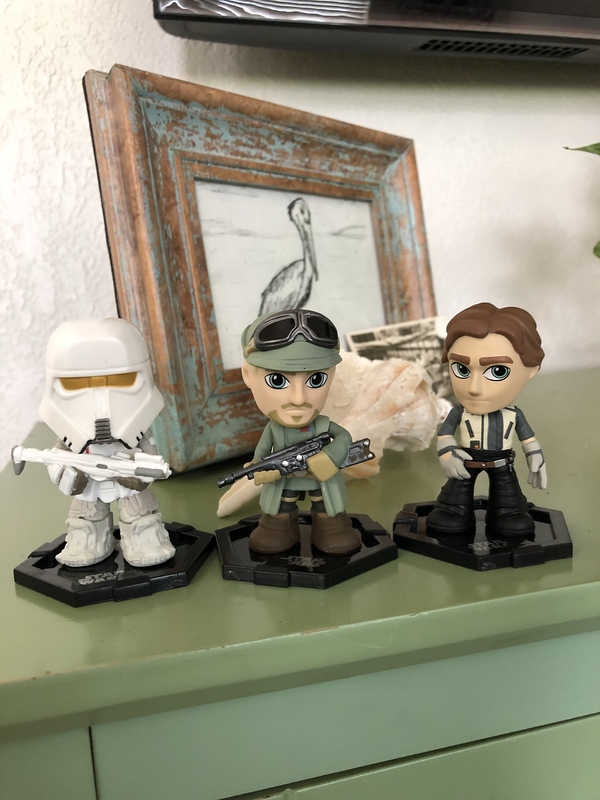 Case E of the TRU minis from the Funko shop has the 2 range Troopers, and Beckett. The two extras spots were Vos and Enfys. Welp ... got case B ... I don't know if I can take the plunge on another case. Maybe have to wait until another sale w/free shipping. I’m beginning to doubt the existence of L3-37. I’ve found over 10 fresh cases in my travels in the last month (nobody around here is buying them), but there aren’t any boxes that match that weight. It’s irritating because she’s the last one I need from the common assortment. nightschwing wrote: I’m beginning to doubt the existence of L3-37. I’ve found over 10 fresh cases in my travels in the last month (nobody around here is buying them), but there aren’t any boxes that match that weight. It’s irritating because she’s the last one I need from the common assortment. There are tons of her on Ebay. More than any of the other 1/72's. Dashtacker wrote: There are tons of her on Ebay. More than any of the other 1/72's. That’s good to know. She’s pretty cheap too — $16.99 isn’t bad for a 1/72 character. I’ll probably give it a few more weeks. It’s just weird because I should’ve already come across one or two of her, given the ratios. not sure of the case #s but out of 2 fresh cases I've pulled Storm trooper (58g) and lando (54.9g)...and L3-37 (48.2g) and lando (55g). Both sets were top middle spots. haven't opened the rest of either case but I will have a few extra target exclusives if anyone needs them. Also have the extra lando. I want the 1/72 Han so bad. Not a single one has shown up on Ebay. Man, 1/72 Han Solo is going to be tough to obtain. Wish they would have showed up in store. That 1:72 Han Solo is really hard. Did not show in the retail store is really painful to find it. Dashtacker wrote: I want the 1/72 Han so bad. Not a single one has shown up on Ebay. A couple have made an appearance on eBay now. I was so lucky to get one from Funko. I hope you can get one for a decent price. It's just tough because I'm sure Funko has a good amount of A cases in their warehouse, but they won't be going anywhere unless people buy them online. One went for over 200 bucks!!!! Yeah...I guess I'm not ending up with one unless I go for the case and get really lucky. Loved this movie. Can’t wait to grab some of these! oh man that 1/72 Han is awesome! I took a chance and grabbed one target exclusive box last night and got the Chewie I wanted. I still want to find the Target han but don't want to end up with someone else. Why are these so addicting to buy? Can anyone break this down for me in terms of how many case possibilities there are with TRU/Funko Shop, and what the differences are? Is it possible to get a TRU case with zero TRU exclusives at all? I keep seeing reference to Case A and Case D and so on. I'm trying to decide if it's worth it to me to take a chance on ordering a case. Any info would be very helpful. Thanks! Last edited by Sking19 on Mon Jul 02, 2018 3:12 pm, edited 1 time in total. Sking19 wrote: Can anyone break this down for me in terms of how many case possibilities there are with TRU/Funko Shop, and what the differences are? I keep seeing reference to Case A and Case D and so on. I'm trying to decide if it's worth it to me to take a chance on ordering a case. Any info would be very helpful. Thanks! Six cases, so a one in six chance of getting the right one. Is there a chance of ordering a TRU case and not getting any TRU exclusives at all? konko wrote: Welp ... got case B ... I don't know if I can take the plunge on another case. Maybe have to wait until another sale w/free shipping. What did Case B have in terms of exclusives? 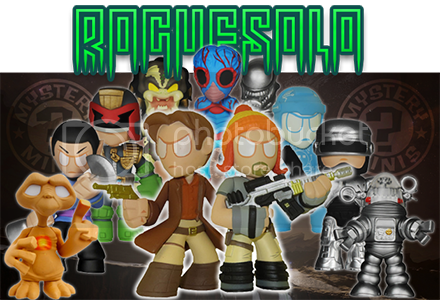 No, you'll get two of the exclusive Troopers, and one of the exclusive Tobias. Just the exclusive Han is 1/72. Two of the exclusive Troopers, and one of the exclusive Tobias. I'm in for pretty much all the star wars stuff. Anyone selling the Han Solo Pilot from ToysRUs exclusive? PM me. Couldn't resist taking a shot during the Funko Labor Day sale. Grabbed 2 cases and ended up with C & D. Not sure I'll ever finish this set thanks to Han. hellojayare wrote: Couldn't resist taking a shot during the Funko Labor Day sale. Grabbed 2 cases and ended up with C & D. Not sure I'll ever finish this set thanks to Han. Looks like a lot of people gave up on this one (including myself). No one's buying these boxes anymore! Still trying to complete this set. Pretty frustrating but the funko haunt is what’s getting so exciting! As to whether you’ll get lucky or not. Not sure what you're talking about. I bought three partial cases at WalMart last week. At $1 a box, why would anyone not get these? groundhog7s wrote: Not sure what you're talking about. I bought three partial cases at WalMart last week. At one of my nearby Wal-marts, they are still $5/each. That's their "sale" price (reduced an entire $0.78), and they have two and a half cases just sitting untouched. I'm still looking for Val at a reasonable prices; hit me up via PM if you have one you want to sell. Cheers, all! Mine did too, that's why they clearanced out Solo. Val was the only good pull from them I got, but already traded her off. If I find another I'll let you know. groundhog7s wrote: Val was the only good pull from them I got, but already traded her off. If I find another I'll let you know. Just need the Han Solo (Pilot suit) to complete the set. This will be a pain. I have a Target IW Groot for trade, if anyone is willing to let go Han Solo.